Toyota, the company that turned the world — and Japan in particular — on to hybrid cars is about to do the same thing for hydrogen-powered vehicles after taking announcing it will put its Fuel Cell Vehicle Concept into production next year. The FCV Concept, which Toyota says is in the final stages of development, was shown off at the Tokyo Motor Show today. The four-seat sedan will have a driving range of at least 500km and can be refuelled in as little as three minutes, which kicks the hell out of charging an EV. Toyota claims it has made great progress in improving the performance of the FCV and reducing the cost of building it, so that it can become a mainstream reality. Cost is relative, of course, with a launch priced tipped to be around 10 million yen — $108,000 —when it goes on sale in Japan's main urban centres, as well as parts of the US and Europe. The Concept has a similar wheelbase to a Camry but is longer, taller and narrower. It uses two small fuel-cell stacks and carries two high-pressure hydrogen tanks. The fuel-cell stacks can now produce twice the power of Toyota's previous FCV development vehicle, meaning this one is good for an output of at least 100kW. Fuel cells use a chemical reaction with hydrogen to produce their own power and the only tailpipe emission is water vapour. Fully fuelled, the cells in the car could produce enough electricity to meet the daily needs of an average Japanese house for a week. Effectively, you could have a small, mobile power station parked in your driveway. 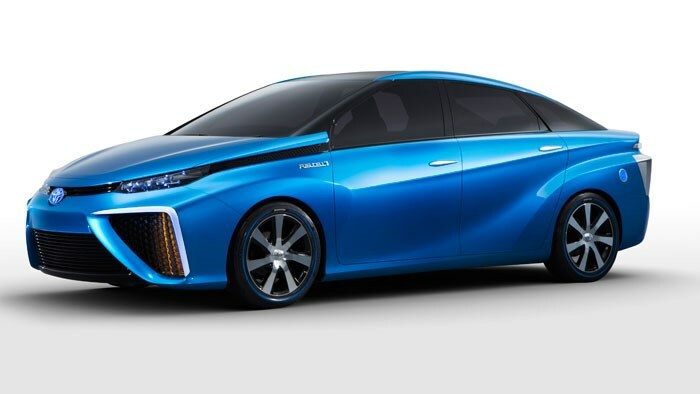 Toyota predicts that hydrogen cars will become widespread by the 2020s and hopes to sell tens of thousands of vehicles annually by then. Toyota Australia's executive director sale and marketing Tony Cramb said the FCV was the future of zero-emissions motoring. “When Toyota introduced the Prius in 1997 no one knew what a hybrid was — or that Toyota had been developing the technology for more than 30 years,” he said. “Yet global sales of Toyota and Lexus hybrid vehicles have now topped 5.5 million and we're building a hybrid version of Camry here in Australia. “As the leader in hybrid technology it is a natural step for Toyota to consider alternate fuels such as hydrogen because of its enormous potential in supporting energy diversification and zero emissions while offering the same convenience as today's petrol-powered cars,” Cramb concluded.